Processes up to 6 5x4" sheet films at any one time. 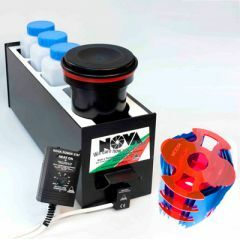 The processor is supplied with a Paterson 3-reel tank and MOD-54 adaptor for holding up to six sheets of 5x4" film. There is also a cutout for a rectangular Combiplan 5x4" tank, but these are no longer available as original equipment.